Father Mike Volkmer, C.PP.S., treasures this handmade quilt given to him years ago by parishioners of St. Mary Parish in Centerville where he had served. 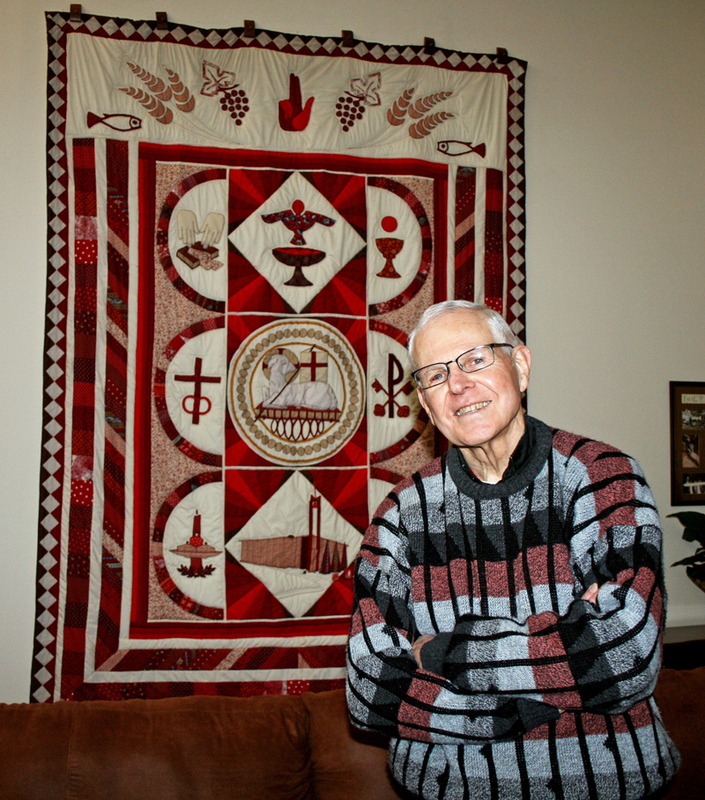 The quilt features symbols of his religious community, Missionaries of the Precious Blood. In the living room of the rectory at St. Mary Parish in Albia, a red and white tapestry covering most of one wall attracts visitors’ attention. 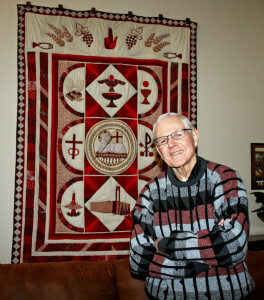 The administrator, Father Michael Volkmer, C.PP.S., received the tapestry as a gift years ago from a parish he previously served, St. Mary’s in Centerville. He traces his hand over the images lovingly stitched into the quilt — symbols of the Missionaries of Precious Blood, the priest’s religious community for nearly half a century. Fr. Volkmer and the members of his religious community are among the more than 900,000 Catholic religious priests, brothers and sisters and consecrated virgins in the world. That figure includes those with temporary vows. This year, Pope Francis asks all Catholics to give thanks to these individuals who have dedicated their lives to God through service to the church and world. The Holy Father proclaimed a Year of Consecrated Life that began the first Sunday in Advent and will conclude Feb. 2, 2016, the Feast of the Presentation of Jesus in the Temple. On Feb. 7-8 this year, parishes around the country are asked to pray for and thank all those who have made commitments in consecrated life. In the Dav­­enport Diocese, the Congre­gation of the Humility of Mary, Davenport, invites everyone to a special Mass on Feb. 8 at 10 a.m. followed by coffee and conversation. At 2 p.m., the Sisters of St. Francis in Clinton will show a film to the public chronicling the history of women religious in the United States. In addressing the pope’s call to live the present with passion, Fr. Volkmer observed: “The pope says go to where no one else wants to go. Where is that calling us today? Who is in need of the message of the blood of Christ, the message of reconciliation?” At present, that means the community’s members serve people living on the margins through work in the inner city, healthcare, pastoral care and advocacy. In his own vocation as a religious order priest, Fr. Volkmer has responded to the call of his superiors first to teach and then to pastoral ministry at parishes in Iowa, Missouri and Wisconsin. The second oldest of seven children, he grew up in Nebraska City, Neb., and belonged to a parish served by Precious Blood priests. As a boy, Fr. Volkmer witnessed his parents’ devotion to the Catholic faith; he attributes their example, in part, to his vocation. His first assignment after ordination to the priesthood in 1968 took him to the former Precious Blood Seminary High School in Liberty, Mo., where he taught for eight years. Then he moved into pastoral ministry, serving first at St. Mary Parish in Centerville from 1976-82. As a going-away gift, parishioners made him the special quilt that adorns his living room at St. Mary’s in Albia today. Fr. Volkmer loves community life, even though his community is far flung. Closer to home, members Father Jim Betzen, C.PP.S., serves at St. Mary of the Visitation Parish in Ottumwa; Father Bill Hubmann, C.PP.S., at St. Mary Parish in Centerville; and seminary classmate, Bishop Joseph Charron, C.PP.S., is retired bishop of Des Moines. Religious priests make vows of poverty, chastity and obedience, although priests in apostolic religious life, such as the Missionaries of the Precious Blood, make a bond of fraternal charity, said Father Michael Volkmer, C.PP.S., administrator of St. Mary Parish, Albia. A religious priest chooses a religious community based on its lifestyle and mission. Missionaries of the Precious Blood, for example, serve the church through ministries in urban and rural parishes, the inner city, healthcare, education and advocacy. Members are teachers, pastors, missionaries, retreat leaders, health care chaplains and justice and peace advocates. Diocesan priests make three promises: to pray the Liturgy of the Hours daily, to obey the bishop and to live a celibate life. The bishop of a diocese assigns his priests to live and work within in the geographical parameters of the diocese, usually in a parish or other assignment.